When I needed to get away from Brisbane for a bit of breathing room, I chose to visit friends who wouldn’t mind taking in our large family with no advance notice. 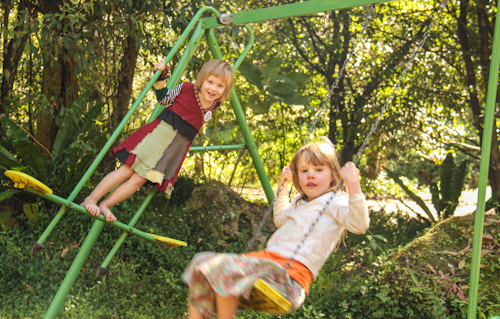 Hellena and Currawong have seven children still living at home — and an eighth currently visiting — and yet they gladly welcomed us into their beautiful space at the intentional community of Billin Cliffs in northern NSW. On our way south, we stop at one of the farmer's stands by the side of the road and stock up on fresh fruit and vegetables. 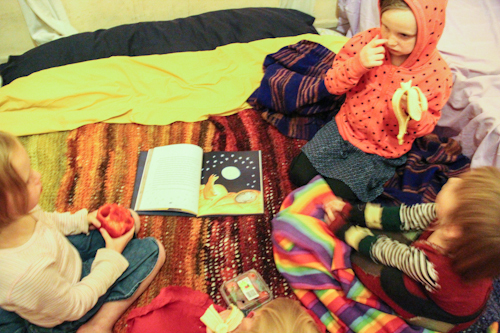 They make a fabulous bed-time snack as I read a story to the girls. 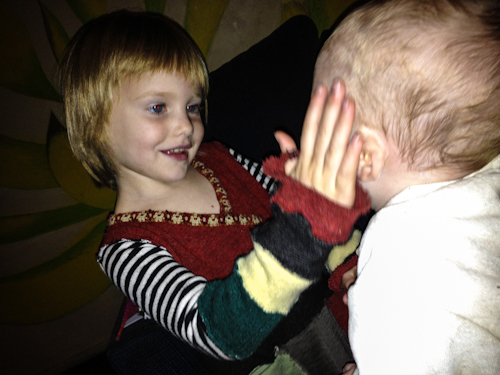 Calista plays with six-month-old Zarrathustra. It's both heart-warming and heart-breaking to be with a baby boy so close to Elijah's age. 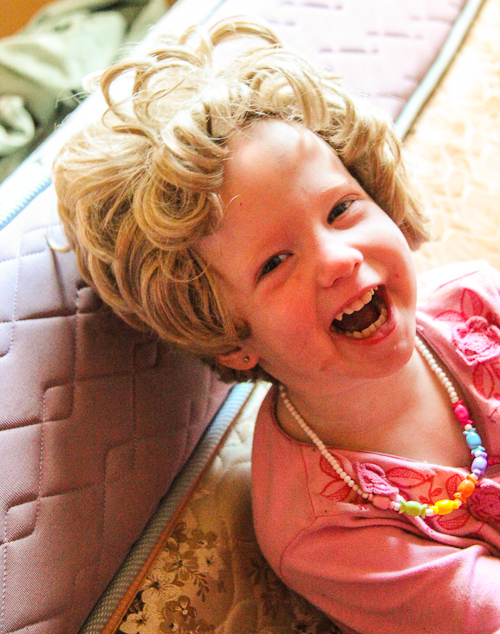 Delaney finds a wig among the dress-up clothes and laughs with delight. 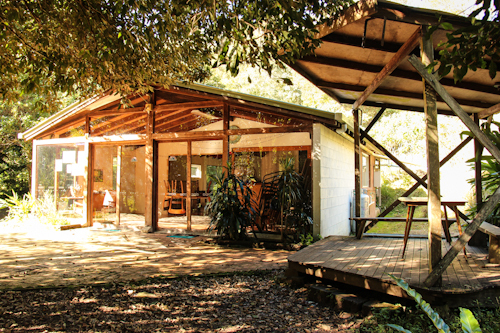 Hellena and Currawong's house nestles in the Australian bush. It's good to be away from the city for a while. 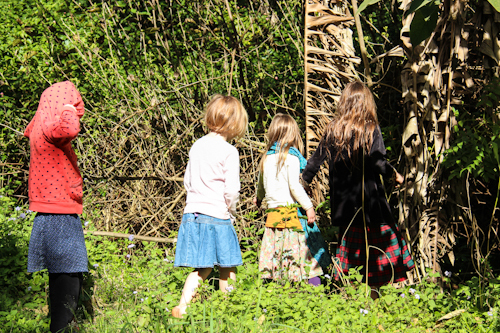 Our girls soon follow Lily and Spiral around the grounds of the community. This was our first visit to Billin Cliffs, so I was interested to follow the girls around and see more of the community facilities. 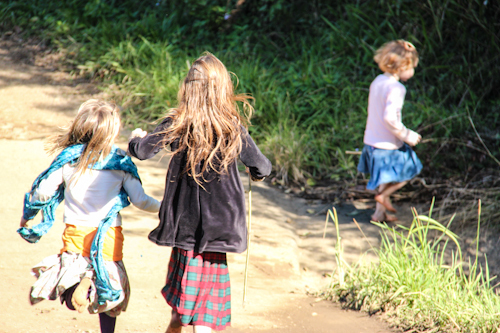 I love the dirt roads that give the girls room to run — barefoot, of course! 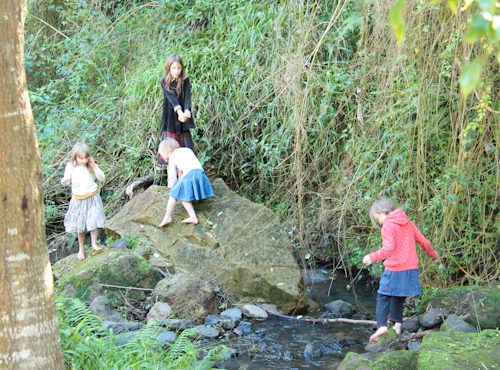 A shallow creek sits at the bottom of the hill, and our girls scramble over the rocks as they try to keep up with their friends. Billin Cliffs offers communal spaces for get-togethers and meetings. There's even playground equipment in the shared spaces. I met some other ladies while our girls were playing at the playground. This was the first time that I received the “all girls?” question, and in providing an answer I choked up. It is so hard to have lost my only son as his absence is magnified by the beautiful abundance of girls that still surround me. The girls practice their balancing skills in front of the meeting hall. 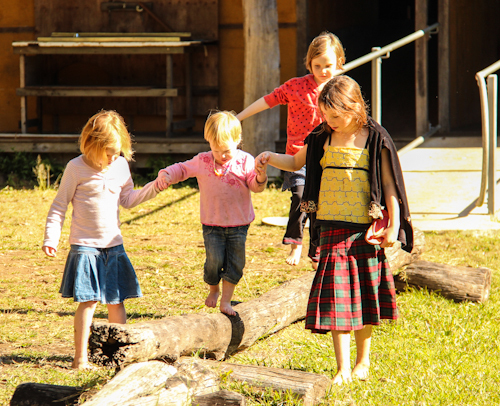 I love the way our children spontaneously join together to help Delaney balance along the log too. Our visit at Billin Cliffs was just what I needed to return home refreshed and strengthened. Our girls’ friendships with Lily and Spiral were strengthened, Hellena and Currawong are so supportive (and entertaining! ), and I’m so thankful to have them in my life. I only discovered your blog today but have spent most of the day reading. Aren’t you just awesome! Anyway, I thought I recognised the names Hellena and Currawong… I used to read her blog years ago :-) The internet is not really all that big I guess. Oh wow! I didn’t even know this was here!! Must have been distracted for a minute. What a blast to find it now though :) Love the retrospective look at where we were at last time we met, and check out how the girls have grown since then!